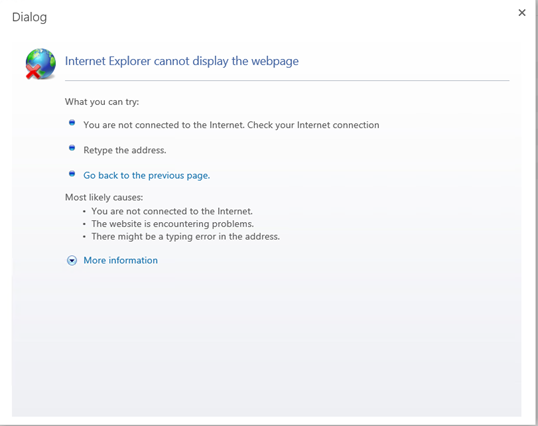 If you got this error, it’s probably because in TFS you set the”/p:DeployIISAppPath” to the URL of a website, for example /p:DeployIISAppPath=”http://vlad.domain.com” . The correct way to specify the parameter is giving the actual name of the website from IIS, for example /p:DeployIISAppPath=”Default Web Site” . Now your error should go away! Get your SharePoint 2013 MCSD with FREE MVA Courses! Successful technologists never stop learning and great technology never stops evolving. Microsoft Virtual Academy (MVA) offers online Microsoft training delivered by experts to help technologists continually learn, with hundreds of courses, in 11 different languages. Our mission is to help developers, knowledgeable IT professionals and advanced students learn the latest technology, build their skills, and advance their careers. 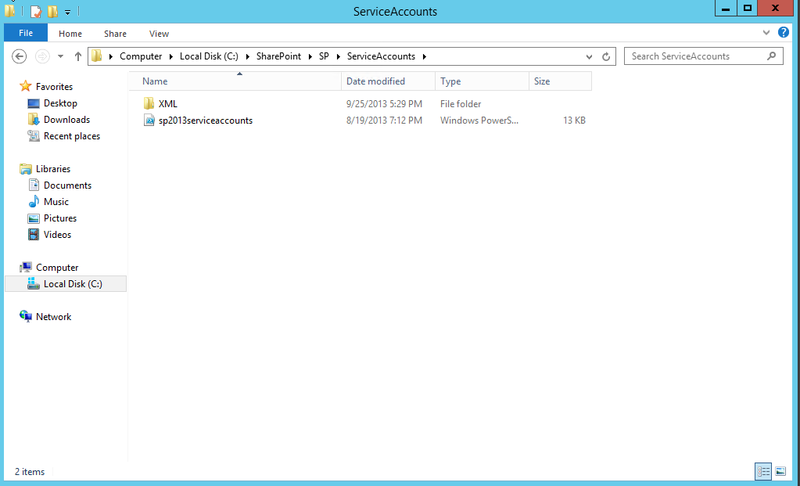 MVA is free of charge, and the entire service is hosted on Windows Azure. Even though MVA has a lot of great resources, I filtered down most of the ones that are directly for you SharePoint Developers. So here are the Resources you can and should use to study for this high level Certification! I have separated them by exam and also added a small description for each of them! Want to learn a different language? Over the course of 21 episodes, our friend Bob Tabor will teach you the fundamentals of HTML5 & CSS3 programming. Tune in to learn concepts about web pages, CSS3 styles and HTML5 features. We’ll walk you through getting the web principals, writing code and much more! Each concept is broken into its own video so you can search for and focus on the information you need. This Jump Start is tailored for experienced application developers interested in leveraging ASP.NET and Visual Studio 2012t o offer modern apps that target modern browsers. Three of Microsoft’s most seasoned ASP.NET speakers provide an accelerated introduction to building web applications development with ASP.NET 4.5 and ASP.NET MVC 4 targeting key scenarios like building mobile ready websites, social web applications, and much more. This is a course for intermediate to advanced learners and helps you prepare for Microsoft exam 70-486. Are you a developer for the Microsoft platform, interested in helping your organization collaborate and manage workflow using SharePoint solutions? Take this course to learn the core skills common to most SharePoint development activities. Find out how to work with backend data and front end user interfaces and security. You’ll get some guidelines and best practices that will help you optimize your SharePoint applications. You’ll see some cool demos that will show you how to create an app, deploy it to a catalog, and install it. And you’ll see workflows inside the dramatically enhanced SharePoint Designer. SharePoint Server developers, if you want to find out how to incorporate SharePoint’s social networking features into your own application, how to call SharePoint Server Search from a client, or how to enhance your Business Connectivity Services (BCS) implementation, this is the Jump Start for you. Learn to write the server and client side code that will enable your users to work more collaboratively, find the information they want more easily, and communicate with the outside world. This course also servers a foundation for learning the skills you’ll need to pass Exam 70-489. Don’t Keep all this cool Knowledge to yourself! Share it with your followers on twitter by clicking the big bird image right under or view the end of the post for more options! This is usually because you either have too many Web Applications in your SharePoint Server, or because your SharePoint Server is slow! 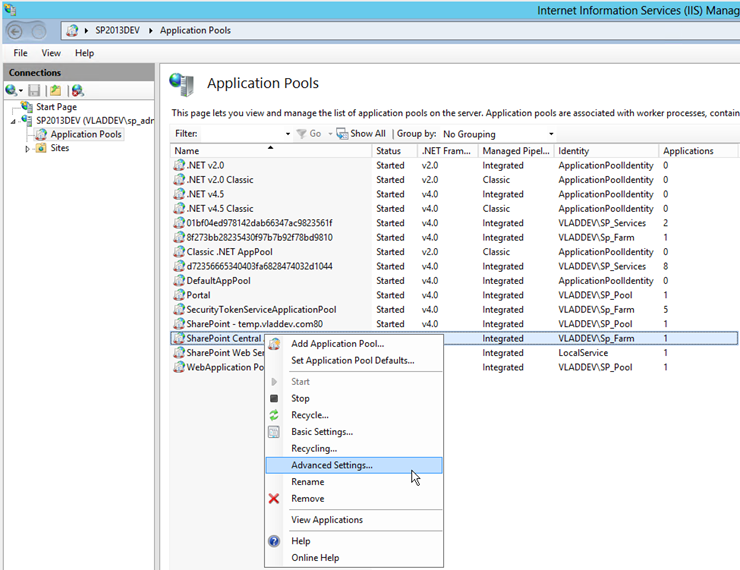 As part of the Web Application creation process, SharePoint resets IIS. By Default, the application pool only allows for 90 seconds for all the connections to close before it down by force. If you got this message it’s because 90 seconds wasn’t enough and we need to increase that limit. The solution to this is to allow the process a longer amount of time before it is forcibly shutdown. On the server(s) hosting Central Admin, open IIS manager. In the tree view, expand the server name and click on Application Pools. 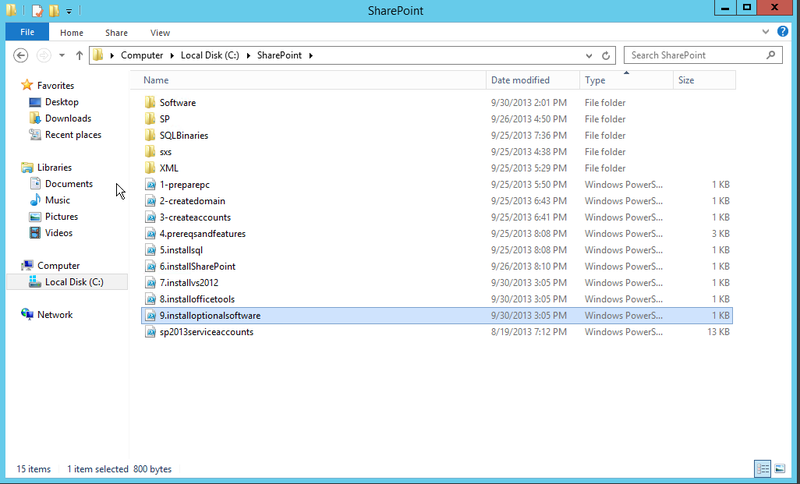 Locate the SharePoint Central Administration v4 application pool. Right click on it and choose Advanced Settings. 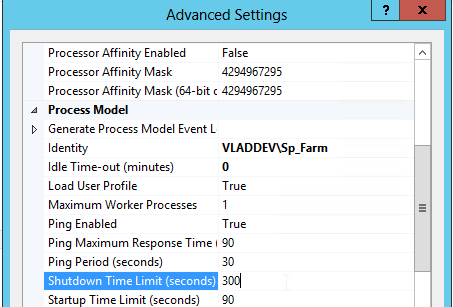 In the Process Model section, set the Shutdown Time Limit to a greater value. As an example, 300. You should now be able to create Web Applications without any troubles! 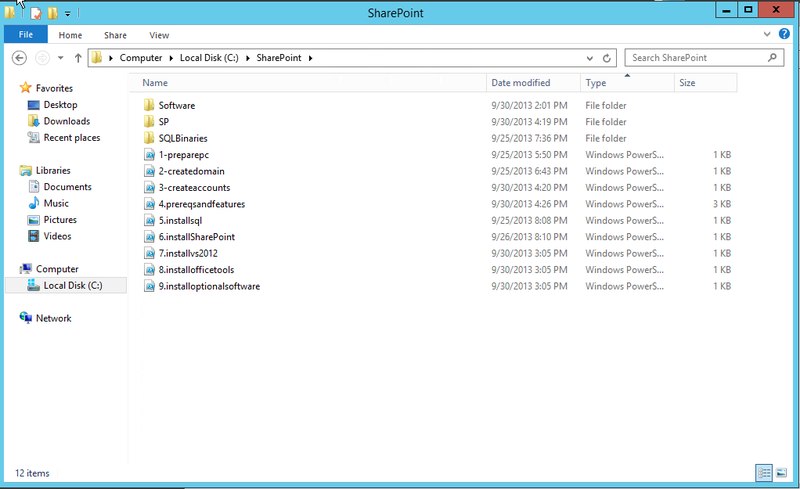 Creating a SharePoint Development Virtual Machine is something you might have to do quite a few times as a Developer. Even if it’s a pretty easy process, on a slow machine it can easily kill 4-5 hours of your day only to install SQL, SharePoint, Visual Studio and all the others tools you might need to get started. What if you could just script it so it’s all done automatically while you go take coffee, chat on SharePoint Community or whatever else you enjoy doing? In this tutorial we will learn how to build a script that we will keep using for as long as you keep developing on SharePoint 2013. The tutorial will be split in a few sections since in order to keep them focused and short, and at the end they will all be published in a downloadable PDF. I strongly encourage you to not only copy the scripts, but actually read the blog posts of why I did them like this and there are some parts where you will need to work as well! Advanced Optimizing of the scripts! The finalized script is now done, and with only a few changes such as the PC name, you and your developers can create SharePoint 2013 development Virtual Machines with all the required tools with only a few clicks! I know the instructions weren’t the easiest, but the task wasn’t easy either! I hope you enjoyed and learned from this series as much as I enjoyed doing it and believe it or not, I wasn’t even sure it was doable when I first started the series. I am glad to announce the release of the second version of The ultimate SharePoint 2013 Certification Guide V2 on my Blog! 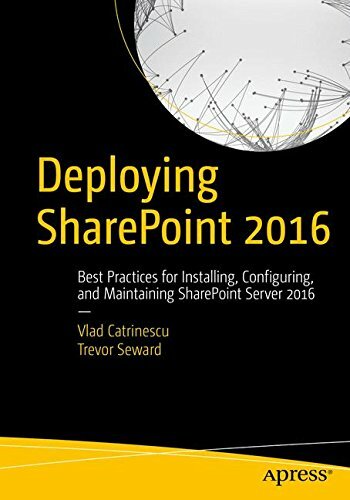 The Guide has been out since September 17th , however it was exclusive to SharePoint Community Members. This guide is aimed at anyone who is considering studying for SharePoint Certifications either to improve their knowledge or to validate existing knowledge about SharePoint. 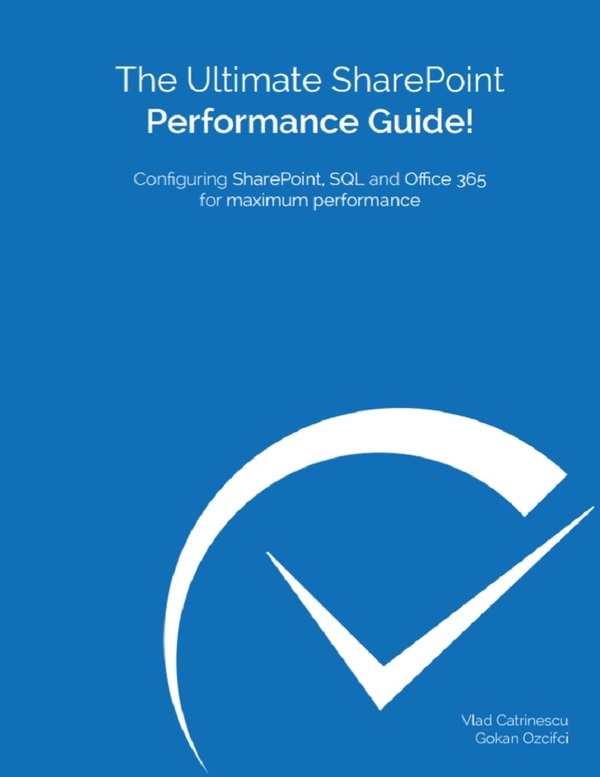 In June 2013, we saw that there was a huge amount of questions around the SharePoint Server 2013 Certifications and we release the Ultimate SharePoint 2013 Certification Guide, which now has over 6000 views! However since then, quite a few things changed with certifications and we decided to add even more value to the guide by adding more info about Cloud Certification and Business Intelligence specialists, and even Yammer Certifications! Furthermore, we have added a ton more learning material and background information for every certification. Added information about Cloud Certifications! Added information for BI Specialists! Information about the July 1st and October first MCSM Changes! A TON of new learning resources for every exam! An eBook Guide of the 6 sections and a video! Welcome to the advanced optimization part of the script. With this section we will make our script go from 6 scripts, to only running one script and then not touching it until it’s done! I warn you that this section will go a lot “Faster” trough the steps because I assume after the first 5 tutorials you got a better understanding of PowerShell! 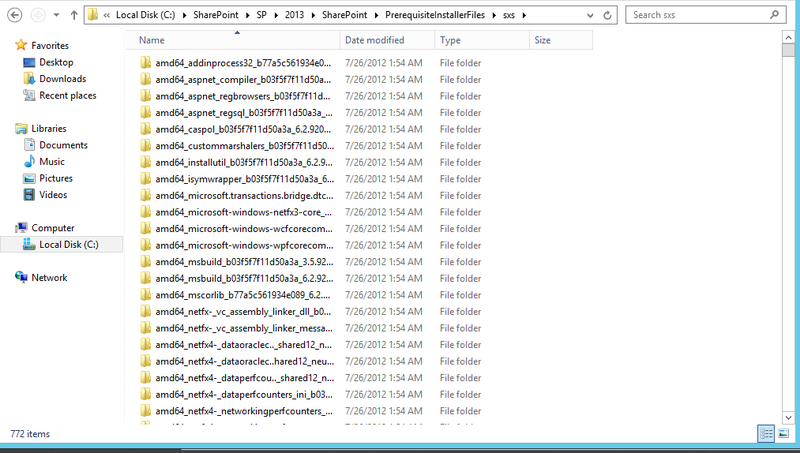 First of all, I want you to create a “Launchers” Folder and a config.xml file in the C:\SharePoint folder. We will see what we put in them later! Open the config.xml file and we will add the following things. 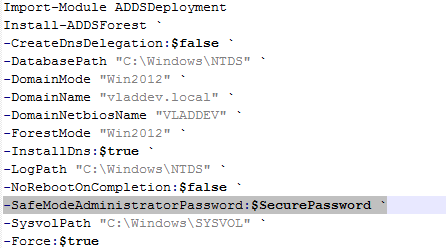 The localadminpassword is the password of your “local administrator” (the account you use before creating the domain), and the serviceaccountpwd is the password you will use for your Service Accounts! Now, open the preparepc.ps1 script and add the following after the “Add-WindowsFeature -Name “ad-domain-services” -IncludeAllSubFeature –IncludeManagementTools” line. Let’s see what we did there! First, we took the password from the config.xml file and saved it in a variable called $password. Afterwards, since we have a reboot we will need a way to start the scripts… so we will use the “RunOnce” registry key. The RunOnce key is what the PC will do the next time a user logs on… in this case we will run “C:\SharePoint\Launchers\createdomain.bat” which we haven’t yet created! Now, the “Winlogon” registry values are there for the autologin. We know our initial account is called “Administrator” and using the $password variable, Windows will be able to automatically log us in! "%SYSTEMROOT%\system32\windowspowershell\v1.0\powershell.exe" -Command Start-Process "$PSHOME\powershell.exe" -Verb RunAs -ArgumentList "'-NoExit -ExecutionPolicy Bypass C:\SharePoint\2-createdomain.ps1'"
Microsoft’s PowerShell Script scheduling isn’t 100% there yet, and I prefer to use .bat files to start our programs. This .bat will start PowerShell as an administrator and run the createdomain.ps1 script! "%SYSTEMROOT%\system32\windowspowershell\v1.0\powershell.exe" -Command Start-Process "$PSHOME\powershell.exe" -Verb RunAs -ArgumentList "'-NoExit -ExecutionPolicy Bypass C:\SharePoint\3-createaccounts.ps1'"
"%SYSTEMROOT%\system32\windowspowershell\v1.0\powershell.exe" -Command Start-Process "$PSHOME\powershell.exe" -Verb RunAs -ArgumentList "'-NoExit -ExecutionPolicy Bypass C:\SharePoint\5.installsql.ps1'"
"%SYSTEMROOT%\system32\windowspowershell\v1.0\powershell.exe" -Command Start-Process "$PSHOME\powershell.exe" -Verb RunAs -ArgumentList "'-NoExit -ExecutionPolicy Bypass C:\SharePoint\6.installSharePoint.ps1'"
Write-Host "Installing Visual Studio 2012"
Write-Host "Visual Studio 2012 Installation Done"
Write-Host "Installing Microsoft Office Developer Tools for Visual Studio 2012"
Write-Host "Installing SharePoint Designer 2013"
Hope you enjoyed and head over to Part 7 (19-11-2013) which is the final Summary and a 1h30 long video of how your installation will look like! This link no longer works, because it may have been moved or deleted. You can try to find it and follow it in its new location. The actual error is because the way Microsoft designed SharePoint 2013 to use only 1 Web Application, therefore only 1 Application Pool account that has access on all content databases. However, for 75% of the enterprises who are still on premise, they have separate Web Applications for the MySites and for the content, and if they followed Service Account security properly they will have a different Application Pool account for MySites Web Applications then the rest of the Web Applications. However, when a user clicks on a site on the MySite, the MySite Web Application Pool account goes to check in the followed site content database if that site still exists. By default, SharePoint 2013 won’t give the Application Pool Account of the MySite Web Application access on the other Web Applications Content Databases, and that’s normal because we’re putting them in different Web Applications to separate them right? 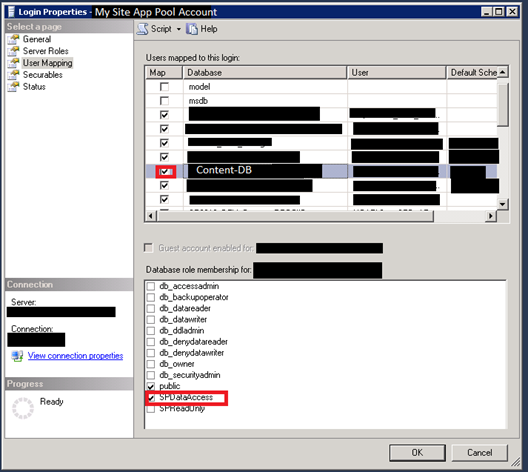 To solve the problem go in SQL and give the account that runs the MySite Application Pool, and give it “SPDataAcces”. Everything should now work properly! As the title says, this part of the tutorial is really just BASIC optimizing. All the “cool” and advanced stuff will be done in the next part, however if you don’t mind doing a minimum of manual Work, you can stop here! All our scripts are now ready, however look at the following screenshot and what do you see? That’s right… a bunch of scripts that aren’t really in order or descriptive! Now, if you give this like that to a developer, chances are he might run the scripts in incorrect order and have lots of errors. Let’s fix that a bit! 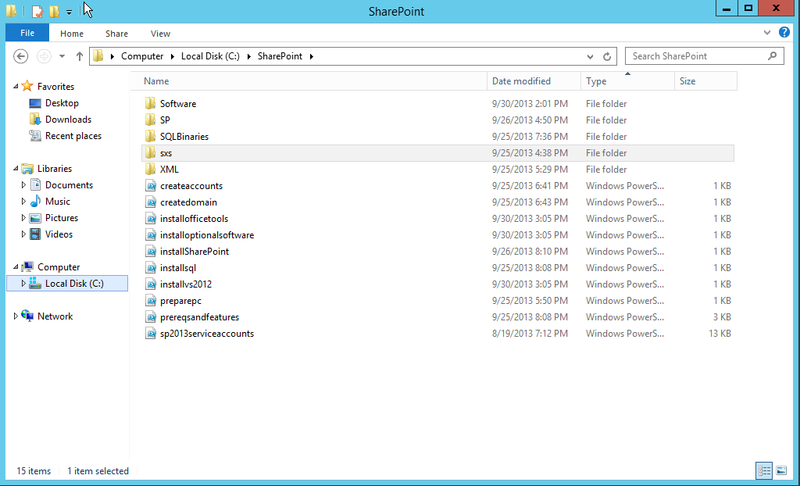 We are now left with a clean, professional folder that is ready to install you a SharePoint 2013 Development Environment with minimal input! Five Blog Posts and about 7000 words later, we now got what we wanted … all the scripts to create a SharePoint 2013 Development machine as well as all the sources that you can put on a network Share and every developer in your company can use! At the end, look at all the programs we can now install automatically! I really hope this was useful for you and you enjoyed not only copying the scripts from a blog post, but also learn the steps and understand why we ran those scripts and the configurations we did. 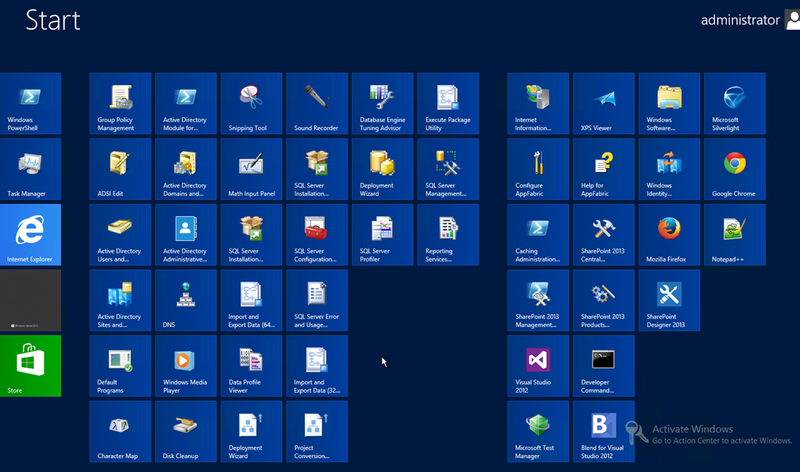 If you are satisfied with the level of automation that we got, you can back up this gold mine on a network share, create an Instructions Manual on how to run it for yourself or your developers and stop wasting time installing SharePoint 2013 Development Virtual Machines! 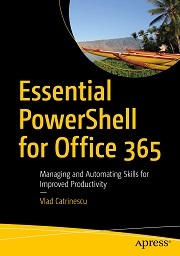 If you are more of a PowerShell fan and want to achieve ultimate automation, check out the next section which will show you how to do so!